Psychological theory and research have much to contribute to the knowledge and skill bases underlying effective policing. Much of the relevant information, however, is dispersed across a variety of different psychological and criminal justice/policing journals and seldom integrated for those applied psychologists interested in policing issues or for police policymakers/administrators and others working in the criminal justice area who are not familiar with the psychological literature. Designed to accommodate the needs of these different groups, this book addresses both operational policing issues and issues relevant to the improvement of organizational functioning by providing integrative reviews of psychological theory and research that deal with effective policing. It illustrates how the theory and research reviewed are relevant to specific policing practices. These include eyewitness testimony, conflict resolution, changing driver behavior, controlling criminal behavior, effective interviewing, and techniques of face reconstruction. The volume's readable style makes it accessible to a diverse audience including undergraduate and postgraduate students in forensic/organizational/applied psychology, criminal justice, and police science programs, and police administrators and policymakers. It will also interest psychologists whose primary focus includes policing and criminal justice issues. The book should draw attention to the often unrecognized and valuable contribution that mainstream psychology can make to the knowledge base underpinning a wide variety of policing practices. Contents: Foreword. Preface. Part I: Psychology and Operational Policing. C. Wilson, H. Braithwaite, Police Patroling, Resistance, and Conflict Resolution. B. Fildes, Driver Behavior and Road Safety. M.R. Gottfredson, M. Polakowski, Determinants and Prevention of Criminal Behavior. R.P. Fisher, M.R. McCauley, Information Retrieval: Interviewing Witnesses. N.W. Bond, K.M. McConkey, Information Retrieval: Reconstructing Faces. D.M. Thomson, Eyewitness Testimony and Identification Tests. W.G. Iacono, Offender Testimony: Detection of Deception and Guilty Knowledge. Part II: Psychology and Organizational Functioning. M.A. Gowan, R.D. Gatewood, Personnel Selection. K.R. Murphy, Integrity Testing. M.J. Lawson, Instruction and Training. J.S. Kane, H.J. Bernardin, M. Wiatrowski, Performance Appraisal. N. Brewer, Leadership and Supervision. G.E. O'Brien, Group Performance and Decision Making. A. Wedderburn, Shiftwork. A.M. O'Leary-Kelly, R.W. Griffin, Job Satisfaction and Organizational Commitment. N. Brewer, C. Wilson, H. Braithwaite, Psychological Research and Policing. "...the most scholarly treatment of a topic that affects and concerns us all." "A collection of 16 previously unpublished papers examines the contributions of psychological theory and research to policing." 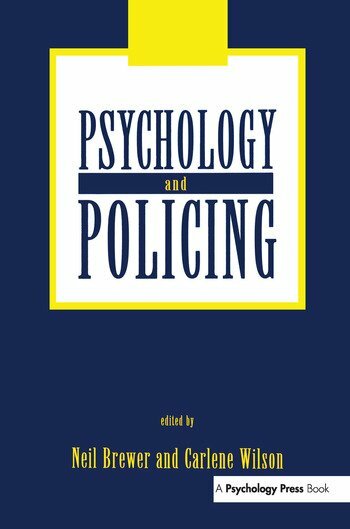 "A glance through the contents page of Psychology and Policing indicates immediately the breadth of opportunity that police work offers to psychologists....I enjoyed reading Psychology and Policing, and consider that it succeeds in making a valuable contribution both to policing and to occupational psychology. I would strongly recommend it to any psychologist working with the police service, and certain chapters are worth reading by any psychologist interested in organizations."